Before Fields ran down the protesters, and then backed up, running down more, what was happening seemed but a bloody brawl between extremists on both sides of the issue of whether Robert E. Lee's statue should be removed from Emancipation Park, formerly Lee Park. With Heyer's death, the brawl was elevated to a moral issue. And President Donald Trump's initial failure to denounce the neo-Nazi and Klan presence was declared a moral failure. Charleston's Emanuel AME Church. A review of Roof's selfies and website showed him posing with the Confederate battle flag. Gov. Nikki Haley, five years in office, instantly pivoted and called for removal of the battle flag from the Confederate war memorial on the State House grounds, as a "deeply offensive symbol of a brutally offensive past." This ignited a national clamor to purge all statues that lionize Confederate soldiers and statesmen. In Maryland, demands have come for removing statues and busts of Chief Justice Roger Taney, the author of the Dred Scott decision. Statues of Gen. "Stonewall" Jackson, President Jefferson Davis and Robert E. Lee have been pulled down in New Orleans. 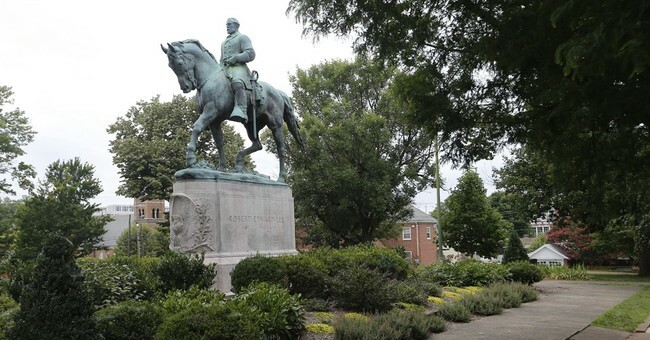 After Charlottesville, pressure is building for removal of the statues of Lee, Jackson, Davis and Gen. "Jeb" Stuart from historic Monument Avenue in Richmond, capital of the Confederacy. Many Southern towns, including Alexandria, Virginia, have statues of Confederate soldiers looking to the South. Shall we pull them all down? And once all the Southern Civil War monuments are gone, should we go after the statues of the slave owners whom we Americans have heroized? Gen. George Washington and his subordinate, "Light Horse Harry" Lee, father of Robert E. Lee, were slave owners, as was Jefferson, James Madison, James Monroe and Andrew Jackson. Five of our first seven presidents owned slaves, as did James K. Polk, who invaded and annexed the northern half of Mexico, including California. Jefferson, with his exploitation of Sally Hemings and neglect of their children, presents a particular problem. While he wrote in the Declaration of Independence of his belief that "all men are created equal," his life and his depiction of Indians in that document belie this. And Jefferson is both on the face of Mount Rushmore and has a memorial in the U.S. capital. Another term applied to the "Unite the Right" gathering in Charlottesville is that they are "white supremacists," a mortal sin to modernity. But here we encounter an even greater problem. Looking back over the history of a Western Civilization, which we call great, were not the explorers who came out of Spain, Portugal, France, Holland and England all white supremacists? They conquered in the name of the mother countries all the lands they discovered, imposed their rule upon the indigenous peoples, and vanquished and eradicated the native-born who stood in their way. Who, during the centuries-long discovery and conquest of the New World, really believed that the lives of the indigenous peoples were of equal worth with those of the colonizers? They believed European Man had the right to rule the world. Beginning in the 16th century, Western imperialists ruled much of what was called the civilized world. Was not the British Empire, one of the great civilizing forces in human history, a manifestation of British racial superiority? And if being a segregationist disqualifies one from being venerated in our brave new world, what do we do with Woodrow Wilson, who thought "Birth of a Nation" a splendid film and who re-segregated the U.S. government? In 1955, Prime Minister Churchill, imperialist to the core, urged his Cabinet to consider the slogan, "Keep England White." Nor is a belief in the superiority of one's race, religion, tribe and culture unique to the West. What is unique, what is an experiment without precedent, is what we are about today. We have condemned and renounced the scarlet sins of the men who made America and embraced diversity, inclusivity and equality.